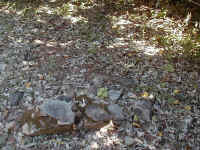 James Gribble, Grave #4 "Sacred to the Memory of James Gribble who died 6 Nov. 1877. Aged 57 years"
Elizabeth Amelia Gribble, Grave #4 "Sacred to the Memory of Elizabeth Amelia Gribble the beloved wife of James Gribble who died January 6 1867 aged 25. Carl Gerhard Wrisberg, Grave #5 (August 21, 1848 to January 1, 1870) " Carl Gerhard Wrisberg Født 21 August 1848, Død 1 Januar 1870, Velsignet Være Mit Minde"
William Carl Hermann Feddersen, Grave #6A (November 16, 1860 to June 30, 1861) "Sacred to the Memory of William Carl Hermann Feddersen, Born: November 16th 1860. 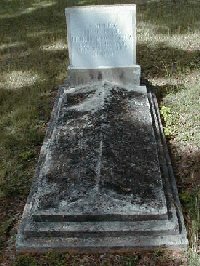 Died June 30th 1861. Suffer the little children to come unto me and forbid them not, for such is the Kingdom of God . 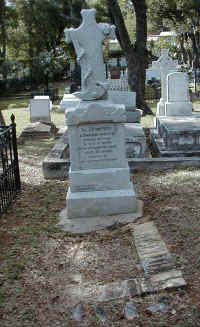 Mark 10 V. 14"
Emily Amory Elisabeth Feddersen, Grave #6B (October 5, 1862 to January 2, 1867) "Sacred to the Memory of Emily Amory Elisabeth Feddersen, born: October 5th 1862, died: January 2nd 1867. Blessed are the pure in heart, for they shall see God. Matth. 5.8. Oh now I am an Angel, And with the angels stand. A crown upon my forehead, A harp within my hand; And right before the Savior so glorious and so bright. I'll make the sweetest music and praise Him day and night!" Annie Xenia Svendsen, Grave #8 (January 20, 1883 to April 9, 1883) "Annie Xenia Svendsen Født 20 Januar 1883 Død 9 April 1883." 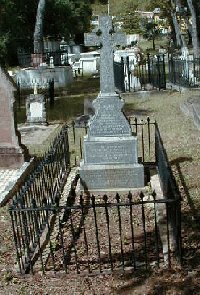 John William Richards, Grave #9 (September 26, 1869 to August 18, 1896) "In Memory of John William Richards, Late Purser of the Royal Mail Steam Packet Co., "S.S. Esk." Born 26th September 1869. 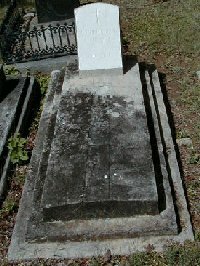 Died at St. Thomas 18th August 1896. "Thy Purpose Lord We Cannot See. But All is Well That's Done by Thee. 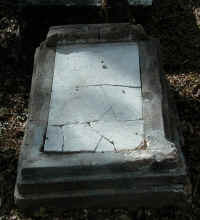 "This tablet has been erected by his Brother Officers as a testimony of their high esteem and regard."" 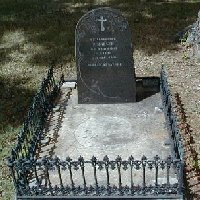 Alfred Emil Hansen & Ferdinand Beech Hansen, Grave #10 (July 5, 1853 to April 22, 1857) & (July 27, 1855 to December 28, 1858) "Sacred to the Memory of Alfred Emil Hansen Born on the 5 July 1853 Died on the 22 April 1857 Sacred to the Memory of Ferdinand Beech Hansen Born on the 27 July 1855 Died on the 28 December 1858"
Edward White, Grave #11 "In memoriam Edward White, Fourth Officer R.M.S.S. 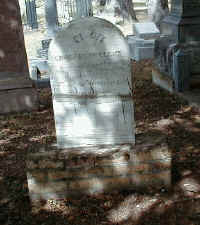 "Eden" Died October 14th 1892 Aged 32 years. 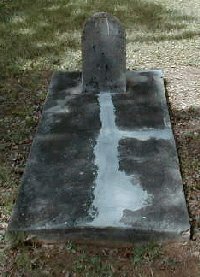 Erected by his brother officers. 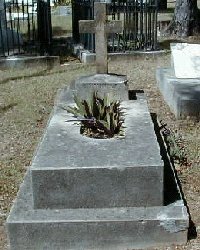 Brinton Bone, Southhampton"
Georges Willeme, Grave #14B "CI-GIT Georges Willeme Aspirant de 1re classe decede a bord de la "Flore" le 17 Novembre 1885, a . . .e de 21 aun." Ida Nathalia Mencke, Grave #15 (August 11, 1824 to October 16, 1869) "Helliget Mindet Om Ida Nathalia Mencke Født Stampe, D 11 Aug. 1824, D.D. 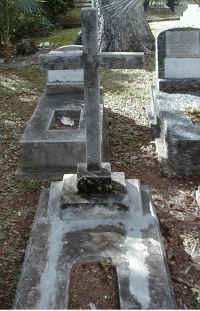 16 Oct. 1869"
Grave #16 "In Memory of . . .gh Stewart Born in St.. Croix 20 Aug. 1864. Aged 42 years." Susan Stewart, Grave #17 "In memory of Susan Stewart, who died 22md Dec. 1868, Aged 42 years." 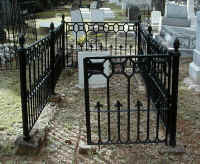 Grave #18 "In Loving Memory of James Stanley and Miriam Love Richardson Sept 6-1905 and Aug 26-1917. George C. Richardson Born Feb, 6. 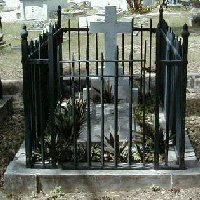 1882 Died Sept29, 1952"
Louise Frederica Lorentzen, Grave #19B (November 13, 1851 to October 28, 1874) "Louise Frederica Lorentzen Born 13th of November 1851, Died 28th of Ocotber 1874. The Lord Giveth the Lord Taketh, Blessed be the Name of the Lord." Rosa Evelyn Malling-Holm, Grave #22A (1887-1955) "Malling-Holm Rosa Evelyn 1887 - 1955" Rosa Evelyn Malling-Holm, wife of Seier Malling-Holm & daughter of Maritime Commission Merchant on St. Thomas, Bentzon Emanuel Danielsen & his wife, Ida Emily Abbot. 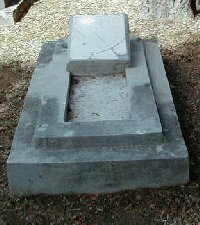 Bentzon Danielson & brother of Josephine Alma Berg (Grave #39 un the First Quadrant). S. Malling-Holm and son, Karl Frederik, Grave #22B (September 6, 1877 to February 21, 1923) & (April 23, 1923 to August 25, 1923) "S. Malling-Hom and son Karl Frederik September 6, 1877 February 21, 1923 April 23, 1923 August 25, 1923." Seier Malling-Holm born & educated in Denmark; Chief Cashier of the National Bank of St. Thomas; Upper Guardian, member of the Public Library Commission. 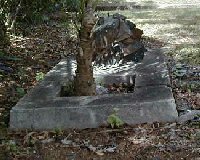 Malling-Holm, Grave #22C (1949 to 1977) "Malling-Hom Elina Anita 1949 - 1977" Gregers Malling-Holm, son of Seier & Rosa Malling-Hom. Elina Annita Malling-Holm, the only child of Gregers Willie Malling-Holm & his wife Anna Biruta Vannska. 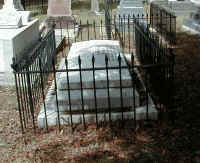 Stephen Dix, Grave #23A (December 29, 1834 to January 19, 1880) "In Loving Memory of Stephen Dix, Superintendent, R.M.S.P. Company. Born at Welling, Kent 29th Decr. 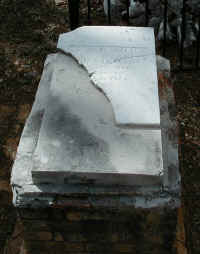 1834, Died at St Thomas, 19th Jany 1880. "Even So, Father; For So It Seemed Good In Thy Sight." Thomas Thompson Bell, Grave #24 "To the Memory of Thomas Thompson Bell of London Civil Engineer Who Died 29th October 1876 Aged 48 years Erected by His Friends In St Thomas." 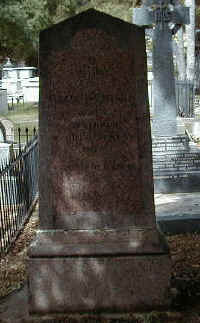 Robert Morrell, Grave #25 (March 24, 1851 to September 18, 1912) "In Memory of Robert Morrell Born At Cambridge, England. 24th. 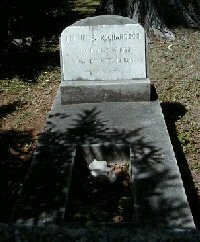 March 1851, Died 18th. September 1912. General Superintendent of W.I. & P. Telegraph Company from 1900 to 1912. 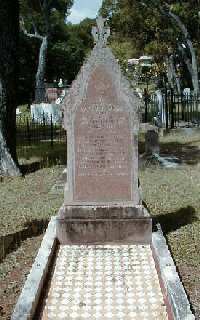 This Monument Was Erected By His Family, In Loving Memory, And By The Staff Of The Company And Many Friends As A Mark Of The Esteem In Which He Was Held." 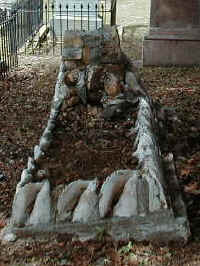 Ulla Marianne La Beet Knudsen, Grave #26, (December 16, 1912 to June 26, 1916), "Ulla Marianne La Beet Knudsen. *16 Decbr. 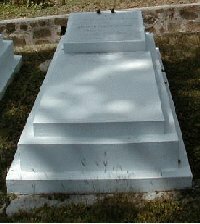 1912, +26 Juni 1916"
George Kellard, Grave #27 "IHS In Loving Memory of My Dear Husband, George Kellard, His Britannic Majesty's Consul, For The Danish West Indies, And Superintendent of St. Thomas Dock, Engineering And Coaling Co., Who Died 12th November 1912, Aged 54. Requiescat In Page." George M. Hunt, Grave #28 "Sacred To The Memory of George M. Hunt, Commander In The Service of The Royal Mail Steam Packet Company. 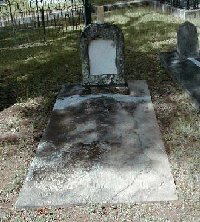 Died At St. Thomas May 29th 1886, Aged 43 Years. This Memorial Is Erected By Some of His Brother Officers As A Tribute Of Their High Esteem And Regard. During His Service of 20 Years He Was Beloved By All Who Knew Him Ashore And Afloat, And His Life Always Proved Him "One Who Loved His Fellow Men."" Capt. 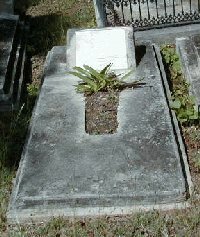 W. S. Symes, Grave #29 "In Memory of Capt. W. S. Symes of The Cable Steamer "Grappler," Who Died In St. Thomas 1 August 1887, Aged 43 Years. 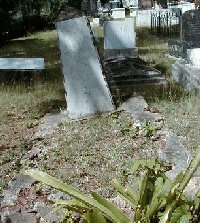 This Memorial Is Erected As A Mark of The High Respect In Which Deceased Was Held By The Officers of The Repairng Steamers "Grappler" and "Duchess," The Members of The Telegraph Staff Throughout The West Indies And Many Friends In St. Thomas." 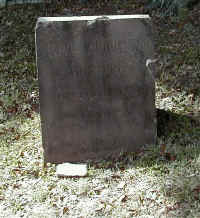 Benjamin Fielding Matthews, Grave #30 "Sacred To The Memory of Benjamin Fielding Matthews, Commander S.S. "Duchess of Marlborough." 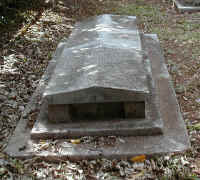 Eldest Son of The Late B. F. Matthews, M.R.C.S, L.S.A. And of Mrs. Matthews, Forest Hill, England. 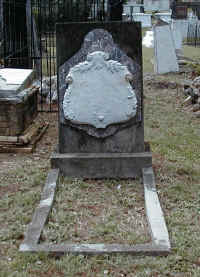 Died October 11th 1892, Aged 31 Years. To The Unspeakable Sorrow of His Family, By Whom He Was Most Tenderly Beloved. "Wearing The White Flower Of A Blameless Life." "God Doth Not Afflict Willingly Nor Grieve The Children Of Men." Cusworth London. N."
A.C. Skiby Christensen, Grave #31 "A.C. Skiby Christensen +19 Marts 1915. Hvil I Fred." Agnes Hinds Hemsely, Grave #32 (August 28, 1866 to January 27, 1949) "Agnes Hinds Hemsely, Born Aug. 28, 1866 Died Jan. 27, 1949"
William Edgar Jones, Grave #33 "In Memory of William Edgar Jones Apprentice third class, U.S. Navy, Died Feb. 2nd. 1902. 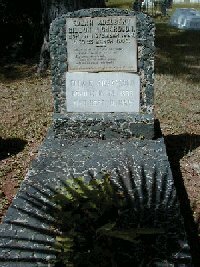 Erected by his shipmates of the U.S.S. Monogahela. J.A.H. Schlesinger." Nellie F. Richardson, Grave #34 (July 15, 1880 to December 19, 1943) "Nellie F. Richardson Born July 14, 1880 Died December 19, 1943. 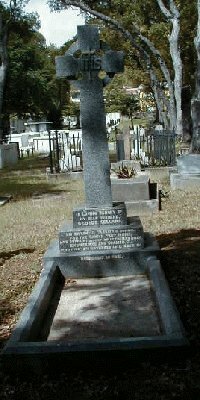 "Always dear to us"
Edgar Adelbert Gibbon Richardson, Grave #35 (November 4, 1884 to March 25, 1900) "Edgar Adelbert Gibbon Richardson, Born 4 November 1884, Died 25 March 1900. 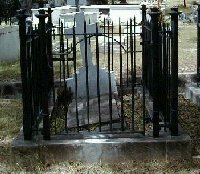 Sleep On My Loved One, Calmly Sleep, While I The Silent Vigil Keep, The Vapor Burneth Low, The Shadows Darker Grow, Around My Heart They Creep. Though My Words Avail Not, I Greet Thy Silent Ashes. 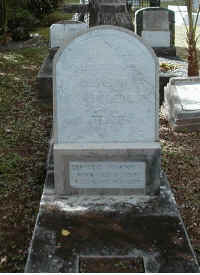 Ella E. Richardson, Grave #35 (March 24, 1888 to September 9, 1952) "Ella E. Richardson Born Mar. 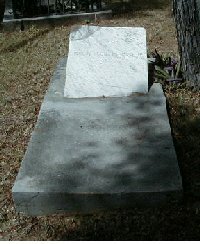 24, 1888 Died Sept. 9, 1952." George William Rhodes, Grave #36 "George William Rhodes, Landsman, U.S. Navy, U.S.S. 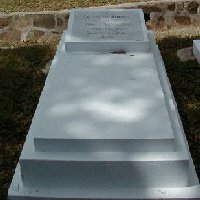 "Dixie" Died February 14th. 1900." 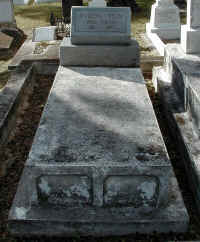 Consul Frederick George Hemsley, Grave #37 (January 21, 1864 to September 4, 1935) "In Memory H.B.M. 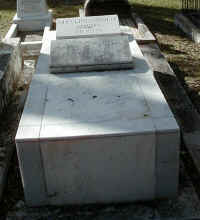 Consul Frederick George Hemsley Born 21st Jan. 1864 Died 4th. 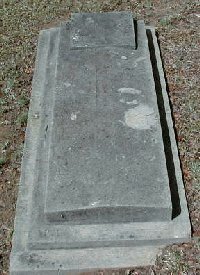 Sept. 1935 At Rest"
O. 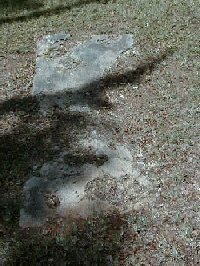 B. Fristrup, Grave #38 (January 22, 1850 to August 6, 1940) "O. B. Fristrup *Jan. 22. 1850 +Aug. 6. 1940"
P. C. Skiby, Grave #39 (January 10, 1833 to February 28, 1884) "P. C. Skiby Født D. 10 Januar 1833, Død D. 28 Februar 1884 Velsignet Være Dit Minde." P. Møller, Grave #40 (March 13, 1823 to September 11, 1885) "Krigsasessor P. Møller *13 Marts 1823. i KJØBH. +11 Sept. 1885 Elsket Og Savnet." G. P. Christensen, Grave #42 (April 29, 1861 to March 2, 1899) "G. P. Christensen, Født 29De April 1861. Død 2N. March 1899"
Nicolai August Fristrup, Grave #45 (June 20, 1839 to May 18, 1892) "Til Minde Om Nicolai August Fristrup, Født I Kiøbenhavn Den 20De. June 1839, Død Den 18De. Mai 1892." Rosita Gladys Varlack, Grave #46 (August 18, 1868 to December 19, 1922) "In Memory of Rosita Gladys Varlack, Widow of J. S. Varlack, Born Simmons *18th August1868, +19th December 1922." 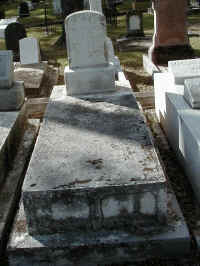 Jabez Samuel Varlack, Grave #47 (November 5, 1858 to May 20, 1916) "In Memory of Jabez Samuel Varlack, Born 5th November 1858, Died 20th May 1916." Johannes Pederson, Grave #49 (March 10, 1911 to January 26, 1986) "In Loving Memory of Johannes Pederson March 10, 1911 January 26, 1986 Peace"
Ejnar Pederson, Grave #50 (June 30, 1914 to August 1, 1988) "In Loving Memory of Ejnar Pederson June 30, 1914 August 1, 1988 Peace"